Whilst wondering around some rather smart wooden cabin-like stores at Trentham Gardens Cinabar and I stumbled into a farmer's style market. We instantly picked up a large basket and started filling it to the brim with all manners of Foodstufffinds' goodies. 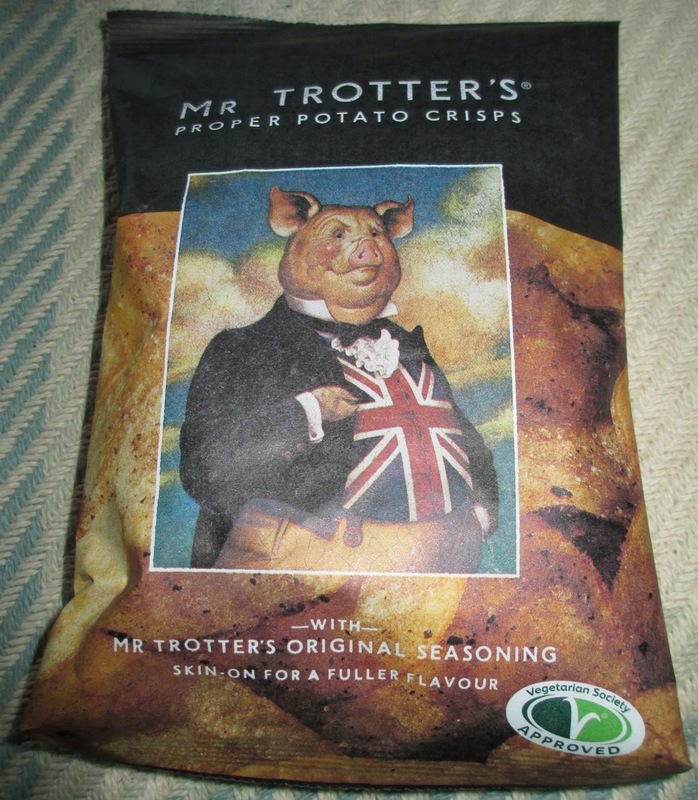 Two such items were produced by Mr Trotter and as I've had the great pleasure of sampling his Jalapeño Chilli Pork Crackling, it came to me to blog about them. And by jove weren't they just made for me! 40g packet. With 528 calories per 100g, with 1g of sugar and 33.9g of fat. GM free. Suitable for vegetarians and vegans. Potatoes and rapeseed oil grown at a neighbouring farm called Wade Lane Farm. Ingredients included; potatoes, rapeseed oil, yeast extract, salt, sea salt, hydrolysed vegetable protein, sugar, dextrose, rusk (from wheat flour). By crikey! A bottle of Mr Trotter's Great British Chestnut Ale to whet my whistle no doubt! Brewed by the Lancaster Brewery this 4% volume amber ale was blended with chestnuts and Maris Otter barley. There was a sweet bitter nutty smell with a hint of spice on opening the bottle. The taste started with a smooth creaminess and a subtle sweetness from the barley, which was soon replaced by the nuttiness and spicy hoppy bitterness from the English Cascade hops and Bramling Cross hops. This was definitely an ingenuous and well thought out brew that screamed quality as had the crisps in the review above. The 500ml bottle's label recommended trying this chestnut ale with quiches (blah, hate quiche... love beer though), pies, pates, and roasts (especially hog roasts I reckon). I'd certainly recommend trying this amber ale with a roast pork meal, with big bold roast potatoes, some greens on the side (for the healthy bit) and lashings of gravy. Either that or try it with a couple of bags of Mr Trotter's Proper Potato Crisps and a good thrilling black and white movie, or indeed an honest British traditional bag of Mr Trotter's Pork Crackling. Just watch out if you buy the Jalapeño Chilli kind!